Any leftfield instrument will only have niche appeal, but we hope there are enough creative musicians out there that want to try something a little different, and there's no doubt that this will spice up your live act, both sonically and visually. Wacky vibe. Detailed construction. Good sounds. Sustain and response. Reverse tuner placement takes some getting used to. Bridge has some sharp edges. Like-it-or-loathe-it style. The Burn's Jet-sonic is the idea of Italian Luthier Claudio Pagelli. With its 'standard' reverse headstock; it's actually the 42mm thick basswood body that's visually striking. "The idea," says Pagelli, "was to make a real compact, funny, different, comic-y, simple, cheeky design - but without compromised build quality. A high-class, quality guitar for open-minded people, young and old, with humour and taste." With an overall length similar to a Stratocaster, and the same 25.5-inch scale, it's not as unusual as it looks, though the maple neck joins the body at the 18th fret. Balance is surprisingly good both seated and strapped on. There's a slightly neck-heavy feel when it's strapped on, but the forearm contour is well placed. Despite a small rear contour and large edge radius, it's actually extremely comfortable to play, which isn't always the case with more radical designs. Although most popular Burns guitars such as the Marvin and all the current modern guitars are bolt-ons, this is a set-neck design; like many early Burns guitars. Inside the neck is Burns' Gear-o-Matik truss rod, originally designed by Jim Burns back in 1960, and adjustment is under a chromed and threaded small circular coverplate on the body. Neck shape is excellent with a deep but well-shaped C section. The fingerboard has a compound radius and is very clean: the 22 quite small-gauge frets (2mm wide x 1mm high) are well fitted and polished, and while some more modern players would perhaps prefer something a little higher, the overall playability feels very positive. The finishes are a little different too. There's a utility-looking muted blue, which contrasts with a vividly-shaped orange plastic scratchplate and toggle switch collar; or there's black (with a slight metallic fleck) with cream plastic parts. Both finishes are satin but they burnish up to a beautiful super-smooth sheen with playing. The bridge is unusual. Originally designed by German hardware company ABM and now copied in China, it's actually six separate bridges, one for each string. Each has its own saddle-block, adjustable for height and intonation, before being locked in place. The string breaks over a brass insert, though these can be pulled out when not under tension. The string anchors at the back of each bridge unit, not through the body. As supplied, the E-E string spacing is 50mm, which is standard for modern Burns guitars, though it's a little narrow when compared to the more modern standard of 52.5mm, or the Fender spacing of 55mm. The Jet-sonic's Wilkinson EZ-LOK tuners have two holes in each post so you can quickly lock the strings in place, although here Burns has strung them in conventional fashion. 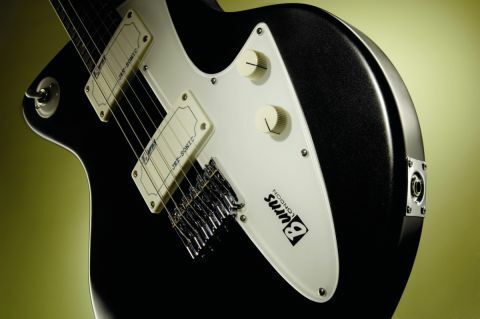 Electronically, things are simple, with two Jet-Sonic humbuckers, master volume and tone, and a pull/push on each to separately split each pickup to single-coil (inside coils). This is a pretty unusual feature: most companies have a single switch to split both pickups simultaneously. This illustrates how carefully Burns has worked to recreate Pagelli's vision. Each rectangle is offset and the top of the moulded plastic pickup cover is arched to match the fingerboard radius. The four corner screws hold the pickups directly to the body, and there's a little height adjustment too. The cool thing about a guitar like this is that you have no idea or preconceptions about how it should sound. Basswood and maple are cornerstones of hot-rod rock tones and the general sound here certainly isn't over-bright, with almost a little compression to the tone. In humbucking mode and on a clean amp channel, there's surprising low-end richness and Gibson-like smoothness to the high-end response. How much of a role the unusual bridge plays in the sound is hard to fathom but we will say that there's no shortage of sustain here and that even with quite a gained sound, there's more separation and clarity to the individual strings. The pickups have a good medium power and in split mode produce some nice twang, again without sounding over-sharp. The ability to split one but not the other pickup results in some interesting sounds too. For example, the split bridge with the full-neck humbucker produces a big, fat voice that's got clarity: a powerful rhythm sound. And it's that chord and riffing theme that surfaces - this guitar is superb at these highly contemporary tones. There's no problem with lead lines, of course, but the smaller frets make you want to shred less and riff out more, and you can get an inspiring and very musical performance with muscle aplenty.